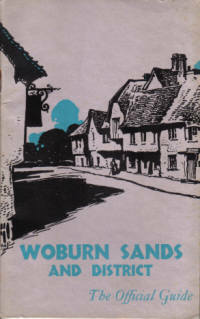 This c.1935 Guide was issued by Edward J. Burrow & Co. Ltd., of Cheltenham, with the authority of the Woburn Sands Parish Council. 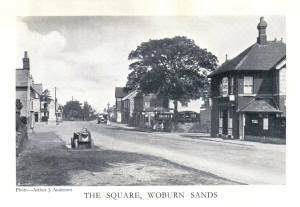 Woburn Sands lies on the boundary between Buckinghamshire and Bedfordshire, the greater part of the village being in the former county. Originally forming part of the Parish of Wavendon it became a separate Ecclesiastical Parish in 1867, when Aspley Heath and a small part of the neigh­bouring Parish of Aspley Guise were included in it. 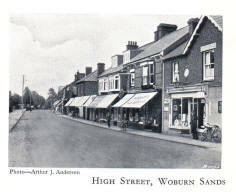 Although it contains several houses of respectable antiquity and not a few picturesque cottages, Woburn Sands is essentially a modern village and has become a shopping centre for a considerable area. An ancient hamlet comprised within the modern parish bore the suggestive name Hogsty End, and old records mention the woods and heath of Aspley Guise as being a feeding ground for fifty hogs. In coaching days Hogsty End was also a halting place on the road between London and the North, and the Swan Hotel came into being probably as a place for changing horses and for the refreshment of travellers. The village is beautifully situated, having the Aspley Woods and Heath within and beyond its southern boundary, whilst to the north lie picturesque Wavendon and the country of the winding Ouse immortalized by Cowper. 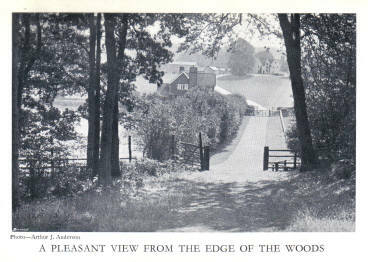 To the west are the wooded heights and the romantic village of Bow Brickhill and on the east is the sandy ridge, on which are the Golf Links, which separates Woburn Sands from Aspley Guise. Woburn Sands has long been recognized as an ideal inland health resort, especially for those who suffer from anaemia, rheumatism, bronchial and pulmonary complaints. It owes its special therapeutic potentialities in these cases to its quick-draining red-brown sandy soil, the pine-clad hills of its surroundings, its clean dry atmosphere, and its sunny climate. 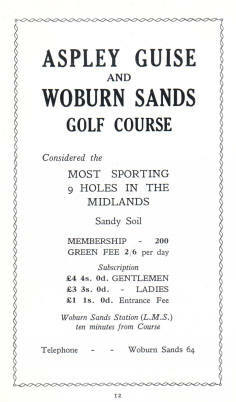 Woburn Sands is also blessed with an excellent water supply and splendid system of drainage. Indeed, it is claimed that the water is as pure as any in England and is suitable alike for drinking purposes and for washing. 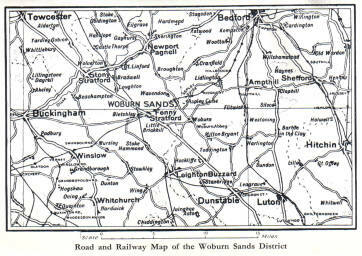 Woburn Sands Railway Station is on the L.M.S, Branch Line which joins Oxford with Cambridge and is about midway between these two termini. This line crosses the L.M.S. mainline from London to the North at Bletchley Junction, which is 4 miles from Woburn Sands Station. 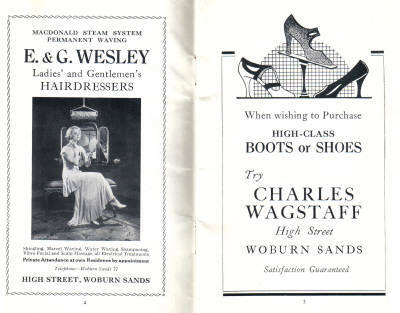 There is a good service of trains from Euston to Woburn Sands via Bletchley, the distance, fifty miles, being accomplished in one and a quarter hours. There is also a good service of trains to Bedford (12 miles). 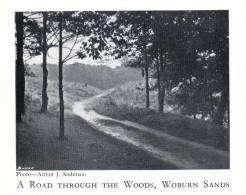 Woburn Sands lies on the main road from London to Northampton, Leicester and Nottingham. It is 43 miles by road from London, and being situated only a few miles from Watling Street has easy access to all the towns situated on that great arterial road. 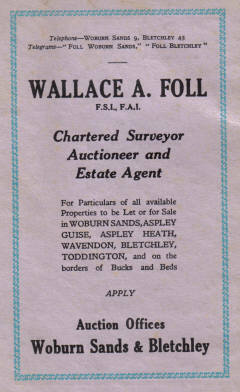 It is six miles from Watling Street at Hockliffe and four miles at Fenny Stratford. Whipsnade Zoo, fourteen miles distant, is reached via Hockliffe and Dunstable. Some of the most delightful parts of the Chilterns around Dunstable are only eleven miles distant. A public hall, built in 1874 on land provided by the Duke of Bedford and known as The Institute, stands in the centre of the High Street. It formerly contained a library, but this is now housed at the Social Club. 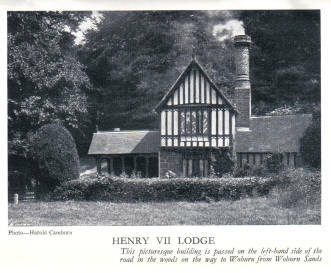 The Institute is the Headquarters of the British Legion and may be hired for concerts, dances, etc. The Parish Council has recently assumed responsibility for this important building, and it is anticipated that it will regain the position it once held in the social life of the village. The War Memorial, in the Square, has an electrically-driven clock. The Social Club, which has extensive grounds, including full-size Bowling Green, three Lawn Tennis Courts and a Croquet Lawn, lies to the east of the High Street and nearby, opposite the Institute. The Club has a billiards room with three full-size billiard tables, and a hall with large stage, capable of seating nearly 300, for theatricals, etc. 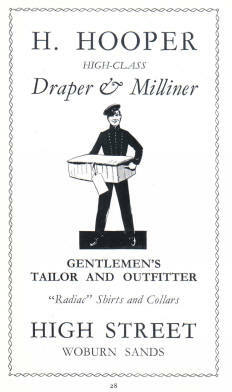 It is in great demand for whist drives, socials, dances, etc. The annual subscription is 12/-, with an additional subscription of 10/6 each for tennis, croquet and bowls. Visitors are cordially welcomed to temporary membership, and modified terms of subscription to meet their case are in operation. Situated in the High Street also is the Ellen Pettit Memorial Hall, opened in 1928 and bequeathed by Mr. A. W. Pettit, in memory of his wife, to the Church of St. Michael. Besides being used as a Sunday School and for Church Meetings, it is available for dances, concerts and theatrical entertainments. No finer site than Aspley Heath could have been selected for a Sanatorium, and here at an altitude of 500 feet above sea level, amidst the sweet scented pines, the Daneswood Sanatorium was erected in 1903 through the munificence of Mr. and Mrs. Bischoffsheim. Since its inception the institution has been of great service in the treatment of those suffering from lung and chest complaints. Ten minutes walk from the centre of Woburn Sands or of Aspley Guise, is a delightful 9-hole Golf Course. Situated on sandy soil and always dry, this course has been described by a leading golf professional as “one of the very best nine-hole courses I have struck.” Its Bogey is difficult to beat and the endeavour to do so will provide excellent sport. Refreshments, light luncheons and teas can be obtained on the course. Visitors may play over the Course on payment of green fees, which are: 2/6 per day, 10/- per week, or 30/- per month for gentlemen; ladies, 7/6 per week or 21/-per month. Sunday play is permitted. In Gipsy Lane are the very charming head­quarters of the South Beds Tennis Club. There are nine well-kept courts and a croquet lawn here. The entrance fee is £2 2s. and seasonal subscription £2 12s. 6d., or an annual subscription of £3 3s. Non-playing Members subscribe £1 1s. A hard tennis court is also available in Woburn Sands. The whole neighbourhood provides facilities for every kind of outdoor recreation. There are cricket and football fields, and at Woburn, two miles away, a splendid cricket ground is maintained by the Duke of Bedford. The district is hunted by the Whaddon Chase and the Oakley Foxhounds. The hounds usually meet within a few miles of Woburn Sands, and provide good going over excellent country. Shooting is also available and good coarse fishing can be obtained within a few miles. The Ouse at Bedford provides ample facilities for boating – indeed all the attractions of Bedford are accessible from Woburn Sands. The Parish Church, dedicated to St. Michael, occupies an attractive position on Aspley Heath. It is a modern building designed by Henry Glutton in the French Gothic style, with a small lantern bell-turret surmounted by a spire. It was consecrated by the Bishop of Ely in 1868. Originally consisting of a nave of five bays, it was enlarged in 1889 by the addition of the North Transept and lengthening of the Chancel, under the supervision of Sir Arthur Blomfield. In 1920 the North Transept was converted by the erection of a screen into a Memorial Chapel to the men of the Parish who fell in the Great War, their names being inscribed on a brass fixed in the Chapel. The chief objects of interest in the church are the oak pulpit and its stone base, the gift of Mr. and Mrs. Stuart in memory of four of their children, and stained-glass memorial windows – the last erected in 1889 to the memory of W. H. Denison, churchwarden for twenty-one years, and another commemorating Maud F. Stuart. There is also a handsome reredos by Sir Arthur Blomfield as a memorial to the Misses C. and E. Pain. Other churches include a Roman Catholic Church, recently erected in Theydon Avenue; there are also Methodist Churches in High Street and Aspley Hill. The Methodist Church is a large building occupying a prominent site in High Street. Its external architectural features are of considerable attractiveness. The interior is roomy attesting the importance in the district of this branch of nonconformity. 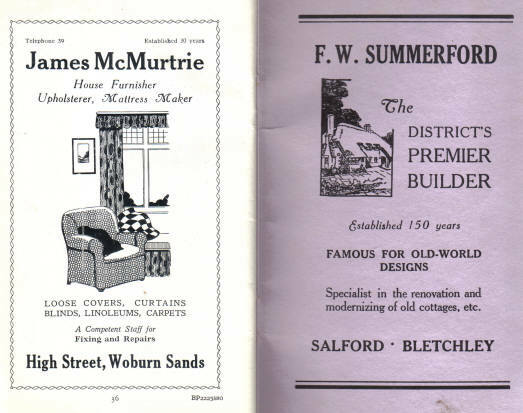 Another important place of worship is the handsome Meeting House of the Society of Friends opened in 1901. It supersedes an earlier building which was erected in 1675, since when the Quaker connexion has been maintained in the village and surrounding countryside. In association with the Friends’ Meeting House are Adult Schools for men and women, besides other organizations. 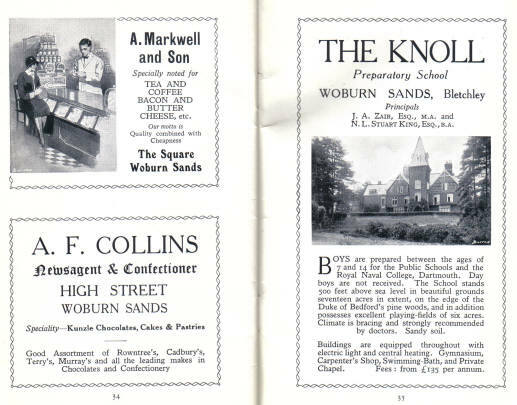 The educational needs of Woburn Sands are very fully provided for both by Council and Private Schools. The Council School was erected in 1868 as an infants’ and mixed school by the ninth Duke of Bedford, and accommodated 260 children. In 1889 the infant classes were separated and housed in a new building adjoining, erected at the expense of Francis, Duke of Bedford, and capable of comfortably accommodating 120 children. The Knoll, standing on Aspley Heath, 500 feet above sea level, is an old established preparatory school for boys between 7 and 14 years. The School prepares boys for Public Schools and the Royal Naval College, Dartmouth, and aims at maintaining as far as possible the standard of simple home life. It has its own private chapel, where prayers are said daily. Its situation, which com­mands splendid views, is admittedly beautiful and extremely healthy, being bounded by extensive pine woods and heath land. The School House is bright, airy, and sunny and is equipped throughout with electric light and central heating. The class­rooms are large and well ventilated, and the dormitories are very cheerful rooms. The grounds are some 17 acres in extent. 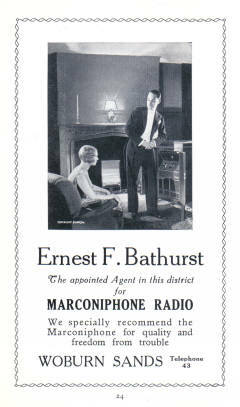 There is a gymnasium, workshop, two large playing-fields, and an open-air swimming-bath. The boys have as much outdoor life as possible and every boy plays games, unless forbidden by medical orders. The Principals are J. A. Zair, Esq., M.A., and N. L. Stuart King, Esq., B.A. 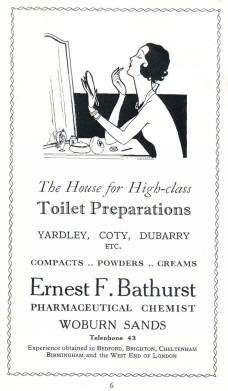 The domestic arrangements are under the personal supervision of Mrs. Zair. Day boys are not received. 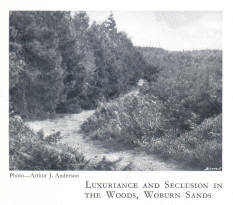 The Water Supply at Woburn Sands and at Aspley Guise, which is remarkably pure and soft, comes from the fine reservoir of 380,000 gallon capacity at Bow Brickhill Heath, opened by the Duke of Bedford in June, 1911. The present modern sewerage system was inaugurated by His Grace at the same time. Both villages are supplied with Gas at moderate rates, and Electricity is supplied from the Bedford and Northampton mains, and is available for lighting and all power purposes. Gas costs 1/4d. 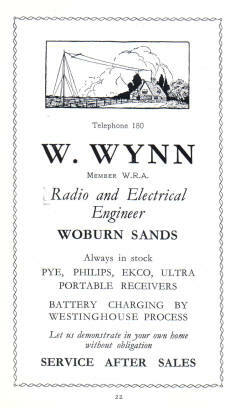 per therm at Woburn Sands and Aspley Guise, and electricity 8½d. per unit for lighting at Woburn Sands and 8d. 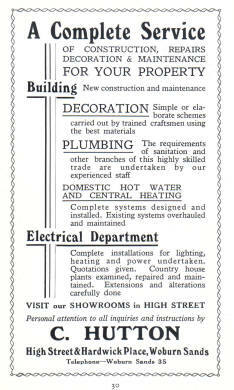 per unit for lighting at Aspley Guise; and 1¼d. per unit for power in both places. 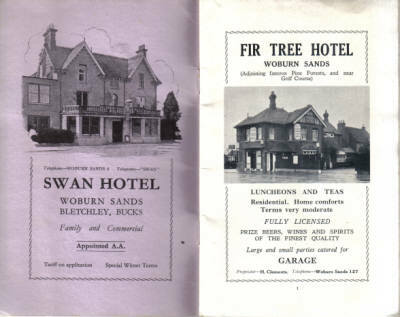 Visitors to Woburn Sands can obtain very comfortable quarters either at the Swan Hotel or at the Fir Tree Hotel. The former occupies a nice situation on high ground near the golf course and pine woods, while the latter is very conveniently situated in a fine open posi­tion in the Square, nearly opposite the War Memorial. 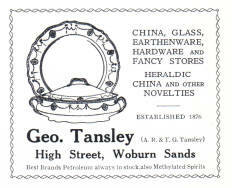 The resources of the shops in Woburn Sands and Aspley Guise are remarkably good, and it is possible to obtain every requirement locally with the utmost courtesy and in the very best quality. Practically every class of trader is represented, and each spares no endeavour to merit the approbation of his customers. Motorists can obtain excellent garage accommodation and have any repair carried out promptly by expert mechanics. 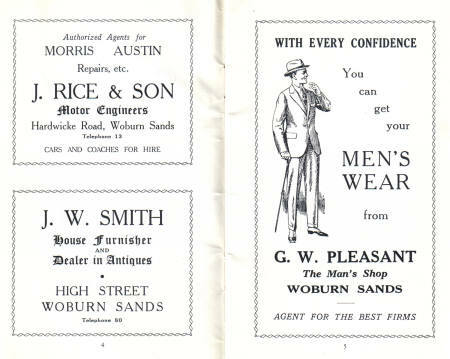 The reader is recommended to carefully peruse the advertisements which appear in this booklet, which convey some idea of the excellent shopping and other facilities obtainable in the Woburn Sands district. Beautifully situated among the hills, Aspley Guise has been acclaimed as one of the prettiest villages in Bedfordshire. It lies partly on the slope and partly at the foot of a sand-hill range, from which the splendid panoramic views of the surrounding country are one of its many attractions. It is about 15 miles from Woburn Sands, and shares with the latter the sanative advantages of the proximity of pine woods and luxuriant plantations of firs and evergreens. The soil here possesses properties which promote the development of these species of trees, which attain enormous proportions and live to a great age. Indeed, there are holly hedges in the village nearly thirty feet in height and known to be more than 150 years old. The presence of so many and such choice evergreens gives the village a subtle charm in winter, and when less favoured spots lack the friendly shelter of clothed boughs, Aspley Guise still retains her mantle of green and remains picturesque and colourful throughout the dead season of the year. Aspley answers for X hides. Acard of Ivry holds it of Hugh (de Beauchamp). The (arable) land is XII carucates. In demesne are 2 carucates, and a third may be made, and XVIII villeins have VIII carucates, and a ninth can be made. There are IV bordars and V servants, and 1 mill of ten shillings. The meadow land is X carucates: wood for 50 hogs. In the whole they are worth VIII pounds: when he received it 100 shillings: in the time of King Edward X pounds -Leuena, Countess of Earl Wallef, held this manor and could retire with (in possession of) her land wherever she pleased. It will be noticed that the manor in this account is referred to simply as Aspley. In later times it became the property of the Guise family, and it is their family name it bears to this day. During the reign of Henry VIII the lands were given to the crown in exchange for territory in Gloucestershire. Henry gave the manor to one of his favourites, Sir Ralph Sadlier, whose descendants still hold it. 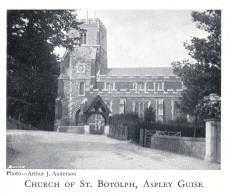 The Parish Church of St. Botolph is of considerable antiquity and of much interest. Restoration and partial rebuilding has deprived it of claims to any distinctive architectural school, but the fabric which remains of the original foundation is in the Decorated and Perpendicular styles. The Tower of somewhat massive proportions is embattled and contains a clock and a peal of bells. Inside there are a number of interesting tombs, monuments and brasses. Among these, in the North Aisle are a raised tomb, dating from about 1409. on which is the recumbent effigy of a knight in armour, believed to represent Sir William Tyryngton, a powerful member of the Guise family, who lived in the reign of Richard II; and an altar tomb for Sir John Guise (c. 1501), with a brass effigy of a knight bearing a heraldic shield. There is also an ancient brass dating from about 1410 composed of figures of a priest kneeling and St. John the Baptist standing. These figures originally stood on either side of a Cross, now lost. The windows display considerable merit in stained glass work, and there is a very handsome reredos. Nonconformist worship is provided by a Methodist Church built in 1813 at the foot of Mount Pleasant and a Mission Hall situated near the centre of the village. Although most of the houses are modern, the village has a number of charming old residences, some of which have been occupied for many centuries. The Old House is the name of the residence of G. Herbert Fowler, Esq., C.B.E. It is a very beautiful example of half-timbered work and dates from 1575. The interior has some good old oak panelling and fine plasterwork. Aspley House, the residence of Mrs. Villiers Downes, was built about 1690, and Sir Christopher Wren is credited with being the architect. The interior contains a great deal of panelling, nearly all the rooms being so treated. Excellent arrangements are provided both for physical and mental recreation. The fine Parish Hall is the accepted centre of social function. It was erected in 1902 at a cost of £1,800, and provides seating for 250 people. It is in great demand during the winter for concerts, meetings, amateur theatricals and socials. Outdoor games are enthusiastically supported and golfers can enjoy the amenities of the Aspley Guise and Woburn Sands Golf Club, already mentioned on page 13. An excellent cricket pitch is laid out on the Common, and matches are played on Saturdays. Tennis, Bowls and Football are played in season. 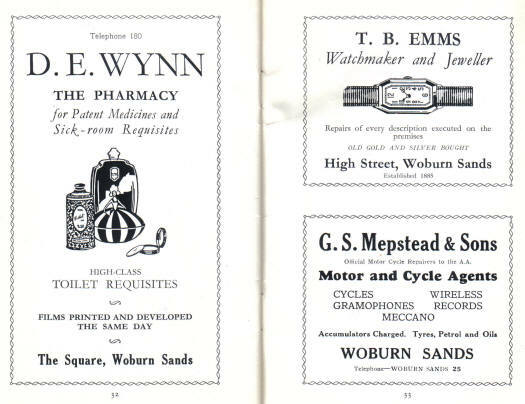 Woburn, about two miles from Woburn Sands, is a town of much attractiveness. It owes its beautiful new Church in Park Street to the munifi­cence of the Duke of Bedford, who erected it in 1865-8 at a cost of £35,000. It replaces the ancient Church of St. Mary, which formerly stood in Bedford Street, and which in being pulled down provided materials for a Mortuary Chapel. The town contains a number of fine buildings – The Town Hall, erected in 1830, in addition to providing a centre for civic administration, is also used as an acceptable venue for social gatherings. Nonconformity is represented by Congregational (founded in 1783) and Methodist Church. There is a fine Institute and Reading Room (erected 1884), an excellent Cottage Hospital built in 1902-3 by the Duchess of Bedford, and in the North end of Bedford Street a number of attractive Almshouses. Woburn Abbey, the splendid seat of the Duke of Bedford, stands on the site once occupied by a Cistercian Monastery, founded in 1145, the conventual name of which is still retained. Robert Hobbs, the last Abbot, rebelled against the authority of Henry VIII at the time of the Dissolution, and was hanged from an oak in view of the Monastery. An oak tree on the Estate said to be this historic gallows bears a tablet commemorating the event. The Mansion, most of which was erected about 1744 by the fourth Duke, is surrounded by delightful gardens and a beautifully timbered park of 3,000 acres ornamented by lakes. Traversed by a public road, it contains enclosures where wild animals, including camels, buffaloes, llamas, zebras, gnus, giraffes, and wild horses, enjoy restricted freedom.